In our global 24/7 world, it's becoming harder and harder to get "face time" with prospects, current clients, or even all of your employees. 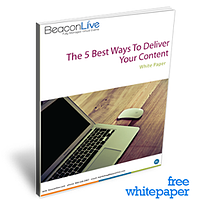 Still, it's imperative that you consistently deliver high-quality content to these groups. But exactly how should you deliver this content? And which method of professional webinar delivery should you choose? Simply complete the form to receive our free white paper now!